In Naples, the exhibition is entitled 'Archeologia che torna' and will take place in the Palazzo Reale from 8th May until 30th September. As well as stolen archaeological finds it will feature objects from clandestine excavations. A large number are southern Italian or Etruscan in origin, their dates range from the 8th century BC to the 5th century AD. Objects from Pompeii will include the fresco of a 'female figure' stolen from the House of Fabius Rufus around 1975 and recovered in 2008 and the double bronze herm (faun and Satyr) stolen in 1988 and recovered just a few months later. 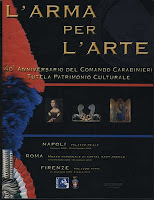 1969 – 2009: 40 anni di attività del Comando Carabinieri Tutela Patrimonio Culturale.